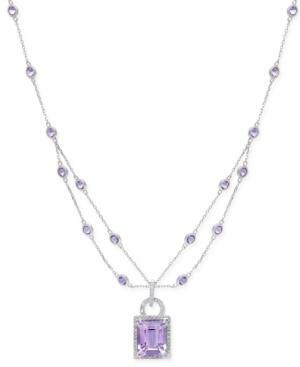 Revel in the exquisite uniqueness of this extraordinary layered pendant necklace featuring emerald- and round-shape amethyst (5-5/8 ct. t.w.) set with shimmering round-shape diamond (1/8 ct. t.w.) accents and set in luxurious 14k white gold. Approximate length: 18. Approximate drop: 1.